IMMACULATE 2-bedroom, 2-bathroom SPIRE condo! One of the larger 2 bedrooms in SPIRE. Low wear-and-tear (owners second home) with upgraded wood floors in the entry, kitchen, living and dining areas. 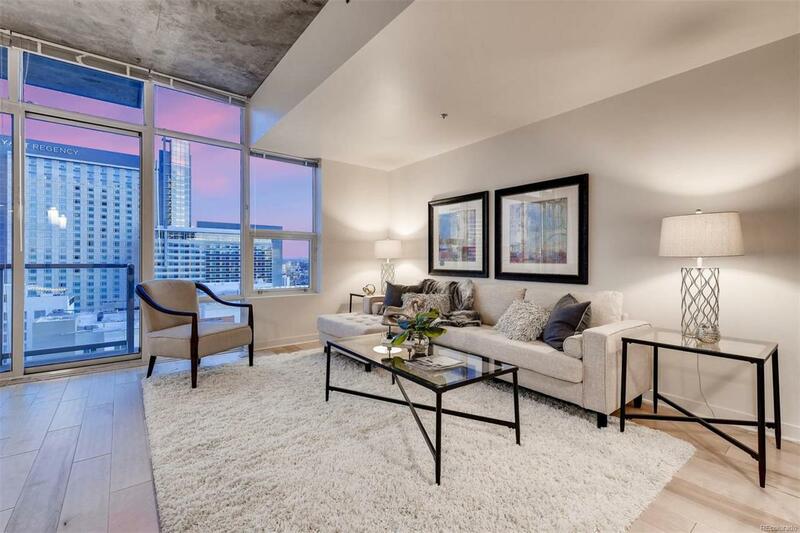 This home boasts a dramatic wall of glass leading out to the balcony, a wide open floor plan, stainless appliances, slab granite and unbelievable city & mountain views. Also included: washer/dryer, a deeded parking space in the attached garage and 1 storage unit. The 42-story SPIRE is LEED-certified, with 40,000 sq ft of awesome amenities, including a rooftop pool which is heated & open year-round, two hot-tubs, extensive health club, The Zone multimedia lounge, the Box Office multimedia theater, garage dog park, yoga garden, outdoor grilling area, 10th floor private event lounge, 24-hour courtesy desk, fully-furnished SPIRE guest suites, special accommodations for electric vehicles, and modern security & access control systems. Come home to Downtown Denver's SPIRE, life is better here!